I initially heard the acronym “STEM” when I had settled into my very first tech meeting at a startup company I had just begun working at. It eventually dawned on me that STEM stood for Science, Technology, Engineering and Math. As an English major who loved to read and write, who had cried over numbers since the beginning of time, who had opted to paint on canvas instead of memorize the Periodic table, and who had never spoken to Engineers a day in her life, I was in awe of everything. I instantly knew I wanted to learn more and couldn’t wait to come back to work the next day. I was also intimidated. As one of only two females in the company, and one of maybe a handful within the entire incubator building the business was situated in, it was both fun and funny coming to work each day. For one, I felt out of place, for two, I was under the impression I was a complete alien on this particular “tech planet”, and for three, I didn’t feel like I could start a conversation with anyone. Except one day, I just decided to start talking. To everyone. About everything. In the beginning all of my conversations were in question format. I didn’t have a retort or reply or suggestion to anything, I simply asked and listened. Slowly but surely, a whole new world opened up to me. I was hooked. I’m still “just” an English major, I still can’t crunch numbers to save my life, and I still have to research terminology several times a week to keep up with all the lightning-quick advances in this ever-expanding field, but I am now completely addicted to this sector. I can even hold my own discussing things like Quantum Physics, Elon Musk or Python, for example. In fact, I find a lot of conversations outside of the tech sector rather boring now. And never once did I imagine or dream of ending up here. It was a fluke, or a product of Quantum, as I like to say these days. It’s a sector many women don’t consider. It’s also a sector many women avoid. And that’s why there has been a global push to make girls and women comfortable in pursuing roles in STEM. 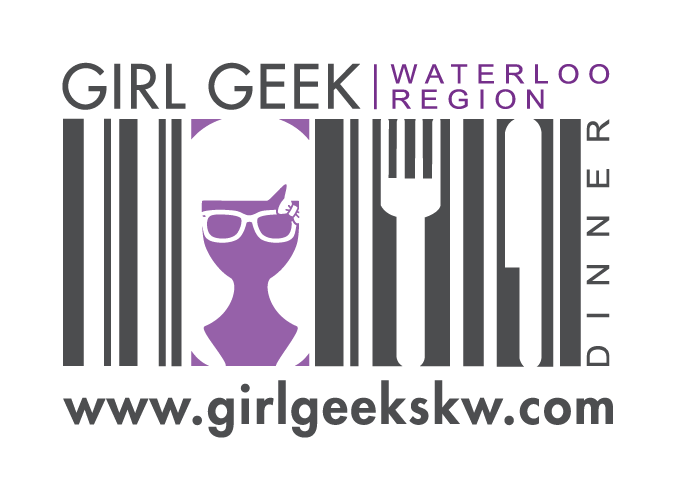 Girl Geek Dinners Waterloo Region blends networking, tech, women (but men are definitely welcome), and of course FOOD, into monthly events featuring intriguing topics and discussions. We’re here to start that thought process, to bring you out of your comfort zone in a welcoming way, and to introduce you to the wonders of STEM. Follow us on Twitter, find us on Facebook, link with us on LinkedIn or just go to www.girlgeekskw.com and find out more.